Welcome to the Kodaikanal Solar Observatory Digitized Data Archive! The Kodaikanal Observatory of the Indian Institute of Astrophysics is located in the beautiful Palani range of hills in Southern India. It was established in 1899. Solar observations at this observatory over the last 100+ years provide one of the longest continuous series of solar data. Apart from that, simultaneous observations in different wavelengths make this data a unique one and suitable for multi-wavelength studies. 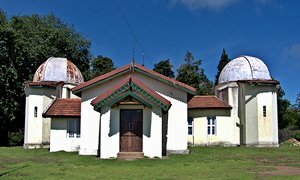 Kodaikanal solar observatory is a facility of Indian Institute of Astrophysics, Bangalore, India. This data is now available for public use at http://kso.iiap.res.in through a service developed at IUCAA under the Data Driven Initiatives project funded by the National Knowledge Network. Note: This site replaces the older site currently available from this link. The present site does not include listings for data obtained from the Twin Telescopes - refer to the old site if you need access to this data. This service has been developed at IUCAA under the NKN Data Driven Initiatives project. © 2018.